Tragic news of Jarvo's illness. Prayers and best wishes, Paul. Really sad that Billy is leaving: thanks for a great five years, Billy. Fingers crossed for Paul! He's a fit young man, hopefully there will be a happy outcome. All the best Jarvo! Folk like Billy are the soul of a club like ours, a local lad, proud to represent his home town. On top of that, he's an excellent player. Gutted to learn that he's leaving. Good luck Billy! 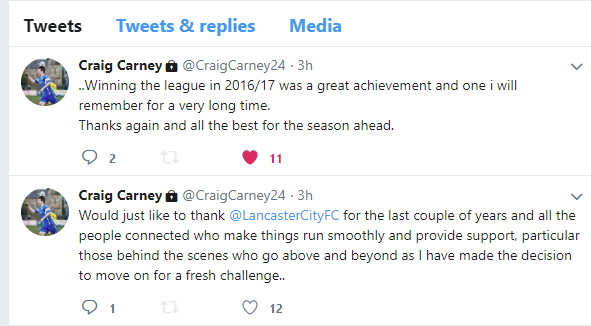 Craig Carney leaving as well. Gifted player, and a major part of what little attacking threat we had. Will be interesting to see what the side looks like next season for good or bad. janb wrote: Craig Carney leaving as well. Good news about the Bailey brothers re-signing. With Craig and Billy gone, plus Jarvo presumably out of action for a while, maybe Charlie will get more game time. Well something had to change. I would start with Sam every time. Surely Charlie too must have been given some indication that he'll get more game time this season. Phil's comments about Charlie would seem to be another pointer to a more positive style of play and even a bit of flair! Please!